BULLYING DOESN’T JUST HAPPEN IN THE SCHOOL YARD – HOW TO MAKE A TOXIC WORKPLACE SAFE – AND READY FOR BUSINESS – AGAIN! The word “bullying” conjures up memories of being pushed around in the school yard, or make you think of stories of kids navigating the online world. But bullying is more than just greasy kid stuff. 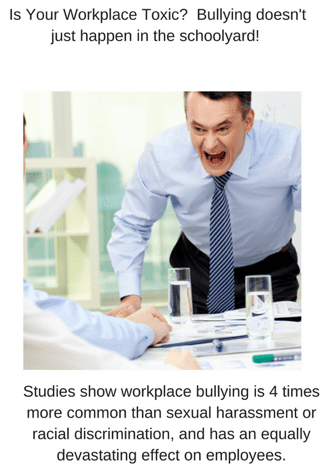 Many adults report being bullied, and disrespected in the workplace, by a superior, by coworkers…oftentimes the culture of a workplace either contributes to the negative environment, or does nothing to stop it. Not only is this detrimental to the emotional health of employees, but it has been proven that it has a negative impact – on profits. In everything from absenteeism to customer retention, a negative workplace environment COSTS. Smart companies are looking to Civility Experts like Lew Bayer and her team to educate them on how to make a difference – to their employees, their customers – and their bottom line.